Bái Táng Gāo (or Pak Tong Gou in Cantonese) is a sweet Chinese steamed rice cake made with rice flour and white sugar. It was my late grandmother’s favourite snack, and she used to buy this for our breakfast. Nowadays, eating and making this sweet steamed rice cake for my family always brings back memories of the love and care my grandmother had for us, and I hope this tradition (and recipe) will continue to pass down to the next generation. It’s a traditional chinese snack that is sweet and light as it is steamed. Always brings back memories of the good ol days when I eat it! It’s a healthy dessert for yourself and the family, as it only contains 150 calories per slice. You can adjust the amount of sugar if you want it healthier! 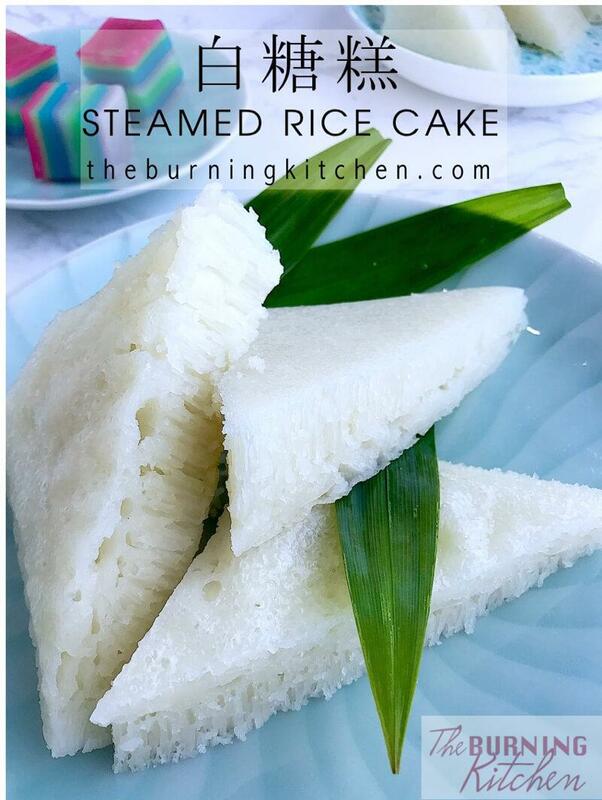 HOW TO MAKE STEAMED RICE CAKE? 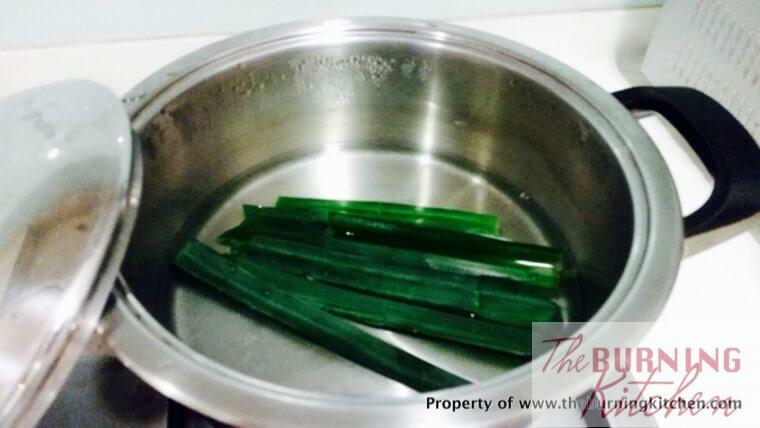 Wash the pandan leaves and cut them into 6-inch lengths. Sieve the 140 gm of rice flour into a big bowl. Then add 1/4 tsp of salt (optional) and 150 gm of water to the flour and mix well with a whisk. For the syrup, measure out 100 gm of sugar into a pot, then add pandan leaves and 150ml water into the pot. Bring to a boil for about 5 minutes. Remove the pandan leaves and sieve the syrup. Slowly pour the syrup into the rice flour mixture, stirring it constantly to prevent it from getting lumpy and set aside and let it cool until about 30°C or warm. If the mixture becomes lumpy, sieve the mixture to remove any lumps. Dissolve 1/2 tsp of yeast with 1 TBsp of warm water and leave it for 5 mins or until it bubbles. Then add the yeast into the rice flour mixture, and 1 tsp of oil and stir well. Cover the bowl with a cling wrap and leave it in a warm place for about 2 hrs or until it bubbles. Grease a 7.5 inch stainless steel plate with oil. Fill a wok with water and bring to a boil. 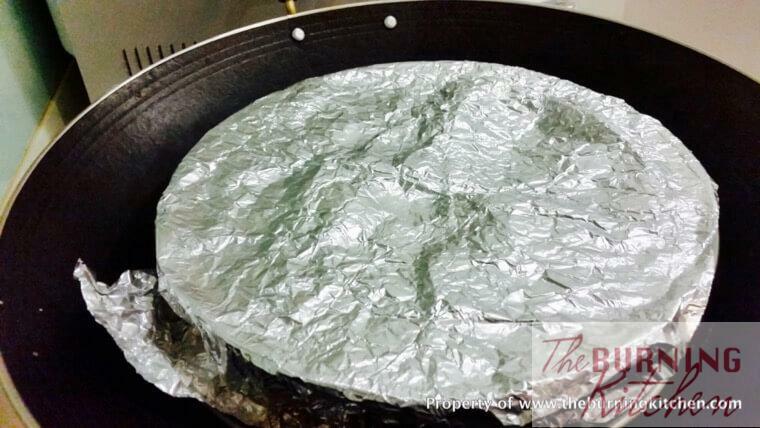 Loosely wrap a aluminium foil over the steaming plate to form a cover. Once the shape is formed, remove the aluminium foil gently. Place the plate on the steaming rack in the wok. 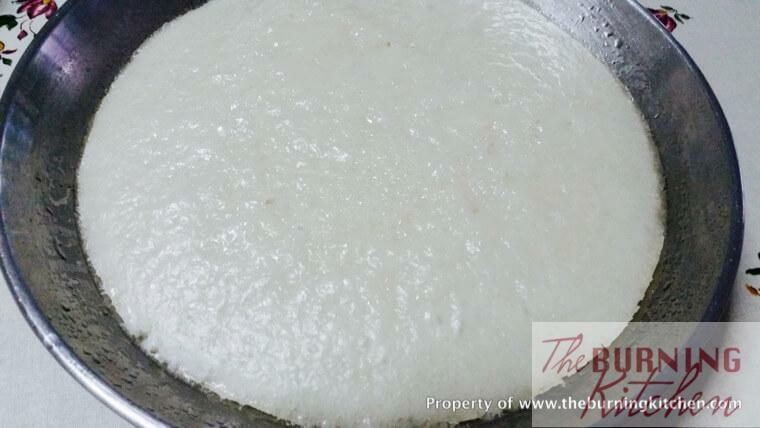 Then using a spoon, stir the rice flour mixture before pouring onto the plate, ensuring that the plate is level. Then cover it with the aluminium foil cover and steam over high fire for about 20 minutes. After 20 minutes, use a satay stick to prick in the centre, if it comes out clean, then it is done. Remove plate from the wok and remove the aluminium foil and let the steamed rice cake / Bai Tang Gao cool completely before cutting. Serve warm or at room temperature. Enjoy! 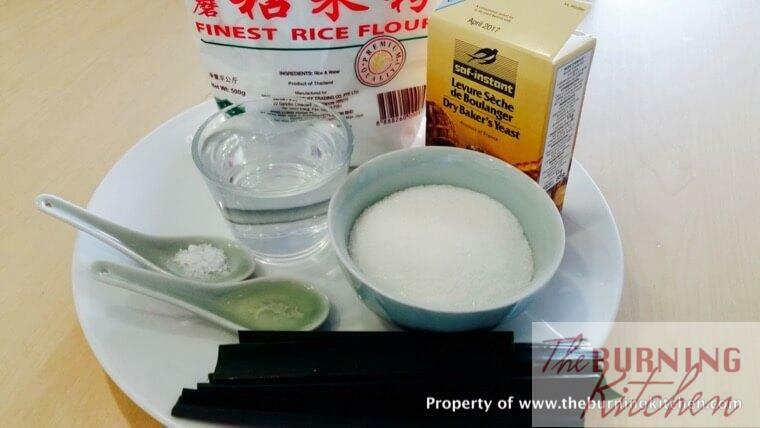 Make sure that the amount of water does not reduce significantly when preparing the pandan sugar syrup. If not, the water will not be the right quantity. Pour the hot syrup into the rice flour mixture very slowly and stir it constantly to prevent lumps. 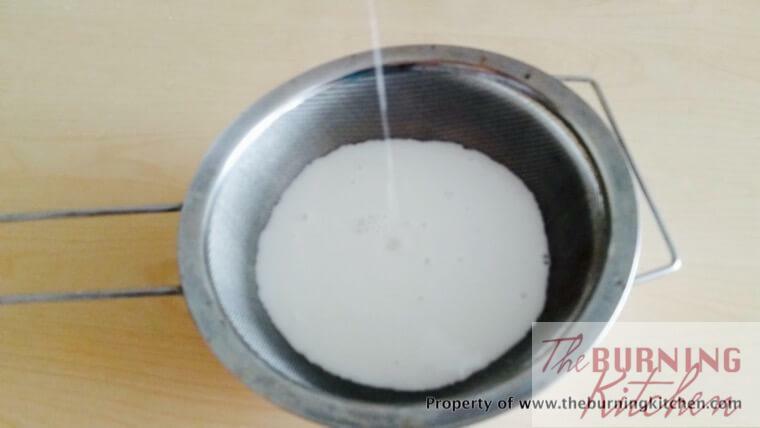 This will ensure that the rice flour and water are mixed well until smooth. HOW DO YOU KNOW IF THE YEAST IS GOOD? Yeast is the key ingredient that aerates the Bai Tang Gao by introduces air pockets to form its distinctive honey-comb structure. Yeast tends to lose its efficacy after being stored for some time (even if its not yet expired). The Bai Tang Gao will end up dense and undercooked if the yeast is too old, as the heat cannot penetrate well to cook it through. Ensure that you see the bubbles form within 5 minutes of mixing it with warm water to know if the yeast is good. 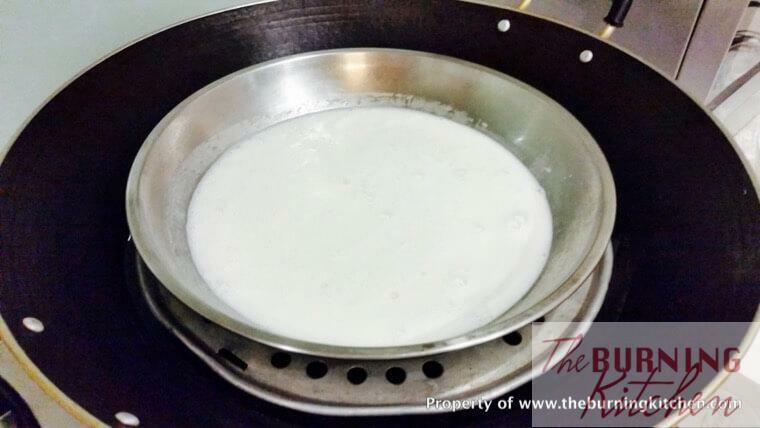 Make sure to stir the mixture well before pouring the rice flour mixture onto the steaming plate. Why? After 2 hours of resting, the heavy flour residue, will sink to the bottom, leaving a layer of water above it. Stir it to mix the flour well. Cover the plate with aluminium foil to prevent water droplets on the wok cover from falling into the plate, and making the steamed rice cake soggy. Alternatively, use a big towel to wrap over the cover. The amount of water for steaming must be the same level as the rack when placed in the wok to allow enough steam to circulate evenly in the wok while steaming. 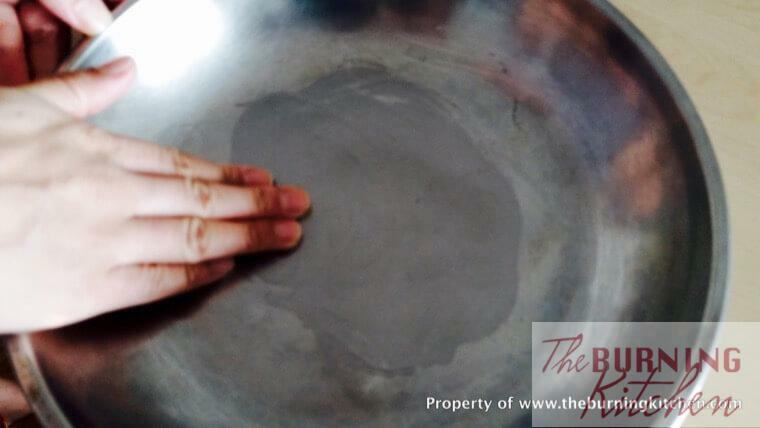 Do not shake the plate when transferring the plate of rice flour mixture into the wok for steaming. If not, the Bai Tang Gao will be lope-sided, with one half thicker than the other. Keep a kettle of boiling water on standby in case you need to top up the water for steaming. 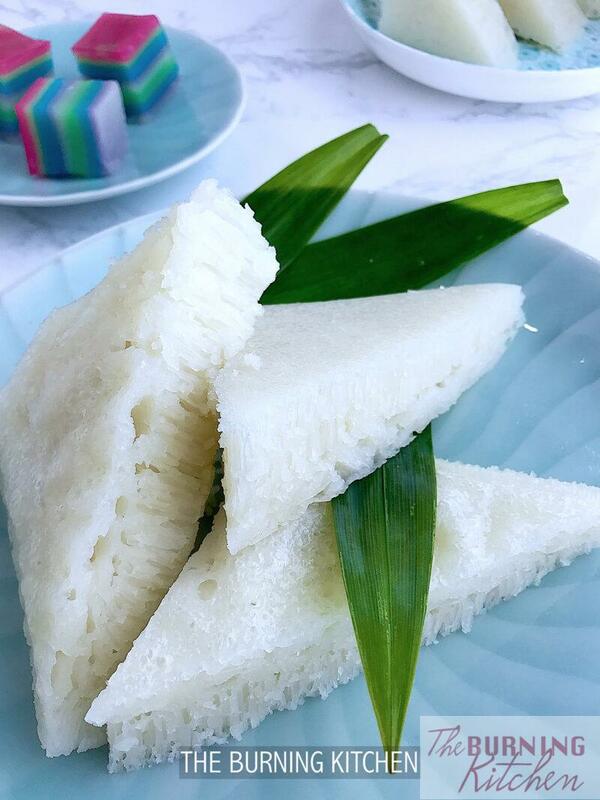 Bai Tang Gao, or Steamed Rice Cake, is a traditional Chinese dessert made with rice flour and white sugar. Bring back childhood memories with this recipe, or make it for your children so that they'll know what it tastes like! salt? where to put the salt pls? Can I replace the yeast with baking soda? Dear Putti, I am afraid not. Yeast and baking powder have different functions. Recipes using yeast usually allows the the mixture to rise before steaming or baking esp for this particular cake. This is because the yeast is a fungi that converts starch into alcohol and carbon dioxide, whereras. baking powder acts during baking process. For the same reason bread needs yeast for the dough to rise before the actual baking. Hi Bee & Melissa… Can I substitute or omit the Pandan leaves? Hi Teri, no problem, the pandan leaves are used to make the steam cake more fragrant, but won’t affect the texture of the final product. If you can’t get access to fresh pandan leaves, you can try using pandan essence, or omit completely. If you manage to try the recipe, please take a photo and email it to us at burningchef@theburningkitchen.com or post it on our facebook page! Hi there, may I know the quantity of rice flour? In your ingredient list, it stated as 140g but in your Cooking Methods, it was stated as 150g ;o). Thank you for pointing out the oversight on our part. It should be 140gm of flour. I have amended the recipe . Wow ! You really have sharp eyes like I always tell my grandson. He can find the smallest things that I can’t. Remember to post a picture input FB page, ok?